Data.gov is launching two innovations today to mark both the anniversary of the Digital Government Strategy and the fourth anniversary of Data.gov. First is a comprehensive listing of the application programming interfaces (APIs) that were released from across the federal government as part of the Digital Government Strategy. These APIs will fuel the development of new apps on everything from health, public safety, education, consumer protection, and many more topics of interest to Americans. Developers can find all the government’s APIs in one place, with links to API documentation and other resources. Data.gov is also launching a new data catalog on an open source data management system called CKAN The new catalog features a number of enhancements, such as an improved search that helps you find all the datasets for a particular location, better sorting and tagging of datasets, and more robust metadata. 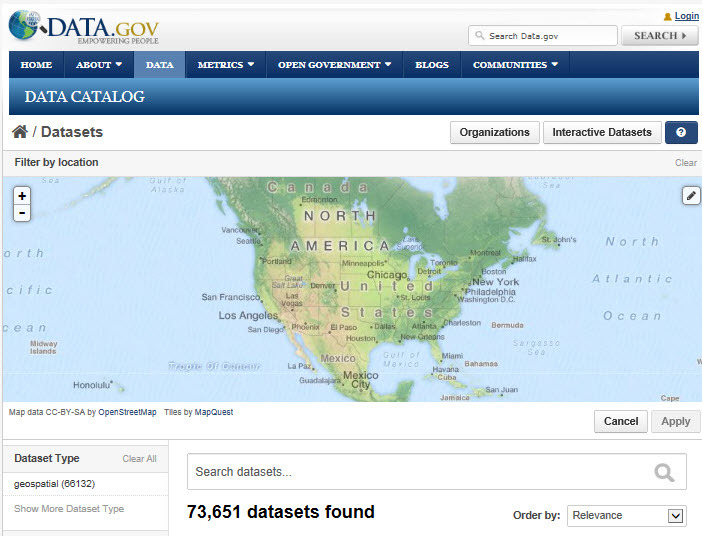 Data.gov now has one unified data catalog based on an open source standard that will make it easier to federate with other federal agency catalogs, as well as those of states, cities, and counties. The new CKAN catalog will also enable the central implementation of the Open Data Policy, as it will easily harvest the data inventories that federal agencies will be creating under the policy. The result will be an easy-to-use, comprehensive catalog that will allow citizens, developers and others to fully take advantage of the vast array of federal data that affects the daily lives of citizens. We also released new tools on Project Open Data that will help agencies easily meet the requirement of the policy, while laying the foundation for the new Data.gov infrastructure across government. Today is just the first step in a number of dramatic improvements in Data.gov scheduled for the months ahead. If you are a developer and want to follow along on the progress, check out the Project Open Data repository on GitHub. Be sure to check out the government-wide APIs and new catalog and stay tuned! Open Data and Open Source – the Wonder Twins of Civic Tech – that will harken all kinds of civic innovation, that will have a material impact on our daily lives, and spawn new businesses and services. Open Data is the Biggest Data – it’s data about us, for us, and paid for by us and its amazing that data.gov is making is making such a great resource available. Keep up the great work!!! This is a great initiative. APIs for online data and catalog will help not only consumers but those into B2B and B2C selling. Apps can readily use these API to build consumer confidence. Open Data and Open Source – the Wonder Twins of Civic Tech – that will harken all types of civic innovation, that will have a material impact on our daily lives, and spawn new businesses and services. Open Data is the Biggest Data – it is data about us, for us, and paid for by us and its amazing that data.gov is making is making such an excellent resource accessible. from my experience, the implementation of the strategy has shown that there may be a lack of a viable mechanism to receive and respond to those who are seeking to provide ideas to OPM via the “Open OPM” forum. Are there plans to improve the “input” and “response” systems?